For groups larger than 40 people, check out some of these other local gems! Snowy Mountain Lodge - Located just 6 miles up the highway from our establishment, this area is in a beautiful location and suitable for larger sized events. Visit www.snowymountainlodge.org or call (307) 742-7669 for more information. 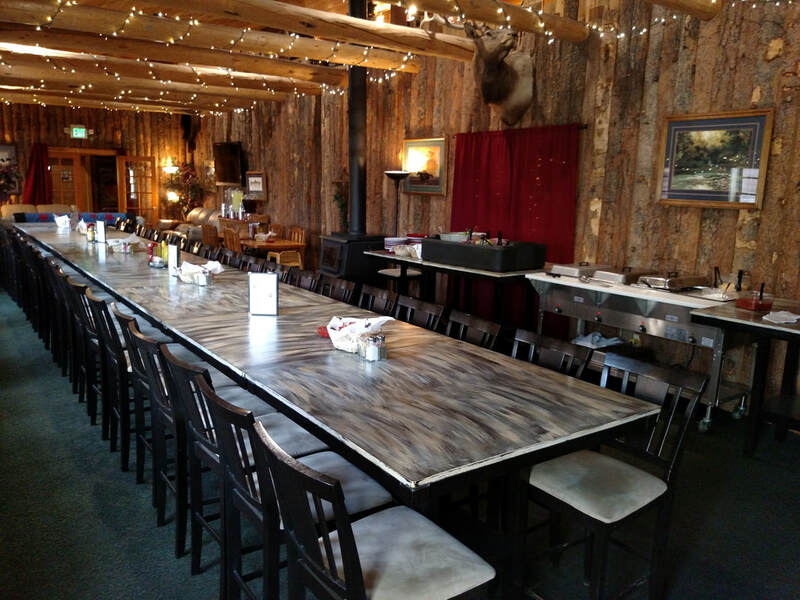 Snowy Range Lodge - Located a short 2 miles from us, this location is highly popular and has the capacity to cater to nearly 175 people! Another neat fact, it is on Wyoming's State Historic Register. Call (307) 742-4943 for more information. Snowy Range Ski & Recreation Area - The Snowy Range Ski & Recreation Area isn't only a great place in the Winter, but in the Summer it makes for a fabulous place to get married with a VERY LARGE space available and on site catering is also available. Visit www.snowyrangeski.com or Call Becky Maddox at (866) 475-4996 for more information. St. Albens Chapel - Located 8 miles up the mountain from Centennial is the perfect location for a quaint wedding of smaller proportions and is very popular for ceremonies. No receptions are available through this location. (But that's why we are here!) Click Here for more information. Vee Bar Guest Ranch - The Vee Bar, located near Laramie, Wyoming just 2 1/2 hours north of Denver, Colorado is a world-reknown family guest and dude ranch with a relaxed atmosphere sure to feel like home to your entire family. Family Guest Ranch activities range from horseback riding to evenings gathered around a campfire. Resting in the shadows of the Snowy Range Mountains in the Centennial Valley, the Vee Bar Guest Ranch is located 21 miles west of Laramie, Wyoming. Click for area map and driving directions from Denver International Airport. Listed on the National Register of Historic Places, this 100 year-old landmark has served as a cattle ranch, a stagecoach stop, a boy’s school, and a buffalo ranch, as well as a year-round guest ranch. With careful restoration and creative decor, its western heritage has been preserved. The cabins and lodge offer antique furnishings from the Vee Bar’s rich and colorful past. Click Here for more information.